The joy of traveling to Africa is being able to see it all at once!!! 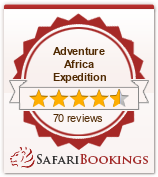 For those who have some time to spare, it is always worthwhile to see more than one African country. This will not only widen your scope about the varied cultures of this continent but will go a long way in creating more excitement and memories of your overall African experience. We at ADVENTURE AFRICA EXPEDITION have created a wide range of mulch-country travel products to show you the true colours of this continent, with special emphasis on East Africa. East Africa comprises of Kenya, Tanzania and Uganda. Kenya and Tanzania are the original Safari countries, and in addition to the safari experience they offer, you can spice up your experience by adding a Gorilla Tracking expedition to the neighboring Uganda. You can start either way you please. The DISCOVER EAST AFRICA MAGICAL SAFARI which combines the best of the three East African countries has become a hit East African explorer. A visit to Africa is a rich experience beyond explanation because the African continent offers a wide diversity of people and environments unequalled by any other region on earth, from its fantastic wildlife and natural landscapes to its fascinating cultural and historical heritage and particularly should be of interest to the African- American traveler to revisit their roots, but also experience what Africa has to offer. Africa is the place to visit because it is awakening as a destination for international tourists, and international tourist’s arrivals are rising every year. And the travel and tourism trade partners are joining forces to ensure that the Continent is put firmly on the map as one of the world’s premier travel and tourism destinations.